The southern boundary of Sutton Park originally lay to the south of Monmouth Drive, but around 1530 the newly-created Warden and Society of Sutton Coldfield granted hundreds of acres of this part of the Park to entrepreneurs who established three large farms on the former parkland. The westernmost of these bordered Chester Road, and a new gate to the Park from Chester Road was made at the border between the farmland and the Park. This became known as Banners Gate, possibly named after one of the sixteenth century farmers there. In the eighteenth Century Sutton Park, and particularly Rowtons Well, was a popular place for outings from the nearby Black Country towns - their preferred route was along Rough Road, so the Banners Gate entrance was their main way into the Park. Increasing use of the Park caused the Warden and Society of Sutton to employ extra keepers to police the park, and cottages were built for them in 1828 at Rowtons Bank and Hollyhurst. In March 1854 the Warden and Society resolved that “a new lodge at Banners Gate is to be built”, and Mr. Greensill’s estimate to build it for £214 was accepted. In March 1855 the minutes record that “Banners Gate Lodge be occupied as soon as possible by a tenant competent to watch the gate and to be employed by the Corporation as a woodman, hedge carpenter, etc.” The next month Edwin Wilkins was taken on at 13 shillings a week. At an enquiry later in the year, Mr. Hales complained about the lodge “They built a house in the Park that is much too fine. It is a very fine house, and only for a labouring man, and I consider they spent a good deal of unnecessary money”. The land on the opposite side of Chester Road from the Park lay in Perry Barr Parish, which was in Staffordshire until incorporated into Birmingham in 1928. Other towns, West Bromwich and Walsall, were considering applying to Parliament for the part of Perry Barr north of Kings Road; this seemed to threaten Sutton’s interests, so on 9th November 1929 Sutton Borough Council decided to present a Bill in Parliament which would extend its western boundary beyond Chester Road. The Sutton Coldfield Act of 1930 came into force on 1st April 1931, and the Banners Gate district of Perry Barr became part of Sutton. As soon as Banners Gate was incorporated into Sutton it was considered ripe for development for housing. Sutton already had quite a lot of council housing - the Tower Road area of Mere Green, Ebrook Road in Sutton, and Cofield Road in Boldmere, while over the border the huge Kingstanding estate was in course of construction, but the development of Banners Gate was left to private property developers. Initially houses were built in ones and twos along the existing roads - Chester Road, Rough Road, Kingstanding Road, Queslet Road and Bakers Lane. For example, a planning application from G. Clark of Maxstoke Road, Sutton Coldfield for 20 houses in Rough Road was submitted in February 1934 (not approved until 26th September, and subject to road widening). The name Rough Road was a bit infra dig, so when the same developer applied for another18 houses in December 1935, they were said to be in a new road “off Banners Gate Road”; likewise Kingstanding Road became Sutton Oak Road. George Frederick Road, Westwood Road, and Longmoor Road were all developed in 1936 and 1937, while we first hear of Reay Nadin Drive in August 1937, and a planning application for seven shops there went in on March 12th 1938. 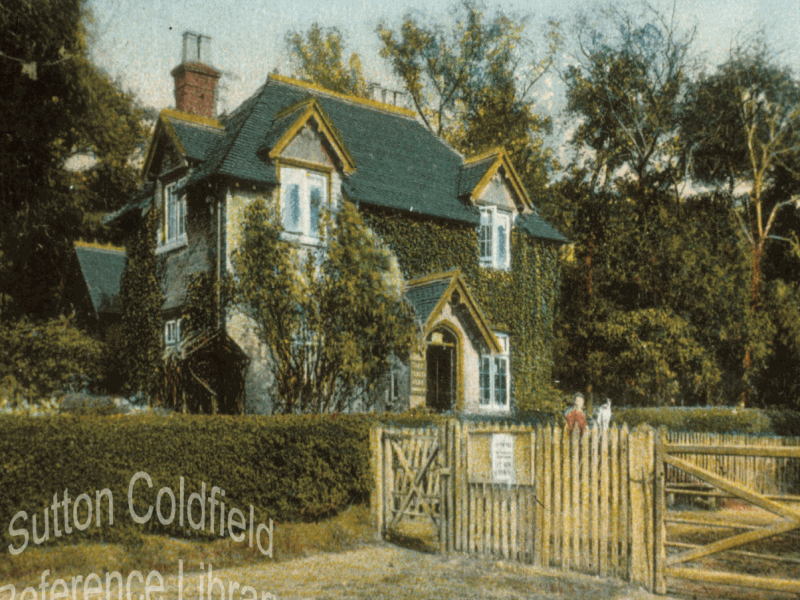 Old postcard view of Banners Gate Lodge (picture courtesy of Sutton Reference Library).